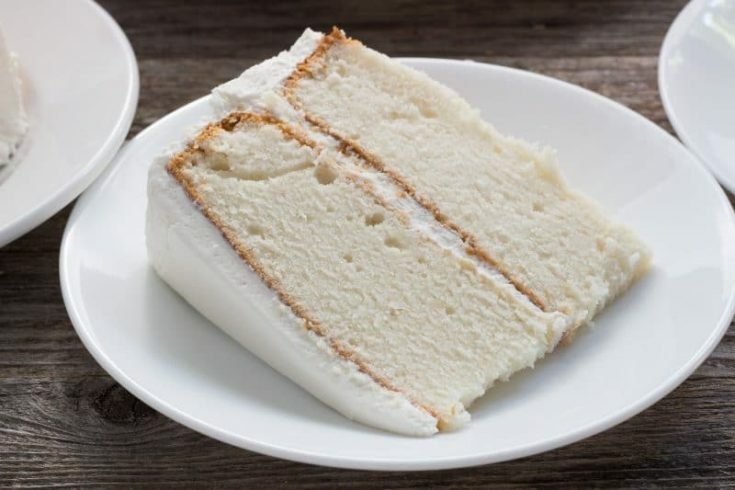 Delicious white cake with white buttercream icing. Tastes like an old-fashioned white wedding cake. Simple enough for beginners. Traditional White Wedding Cake recipe with a simple white buttercream icing recipe is by far the most requested recipe that comes out of my kitchen. Yes, this one starts with a box mix. Generally, when I am baking I am totally cooking from scratch. But this way is the only way I have been able to get even remotely close to the old-fashioned traditional white wedding cake that came from a bakery eons ago. Starting with a cake mix has a larger margin for error. I strongly suggest testing this recipe several times in the pans you plan to use for any formal purposes. I also suggest starting a week or so in advance and freezing the cakes prior to the event. It may take longer to bake multiple layers than you anticipate. The other exception my rule of scratch baking is whenever I am feeling a bit nostalgic and want chocolate cake with peanut butter icing. One like my mom used to make. It was just a chocolate fudge cake made from the box topped with peanut butter icing she made out of a can of white frosting. She was making that cake ages before that flavor combination became all the rage. 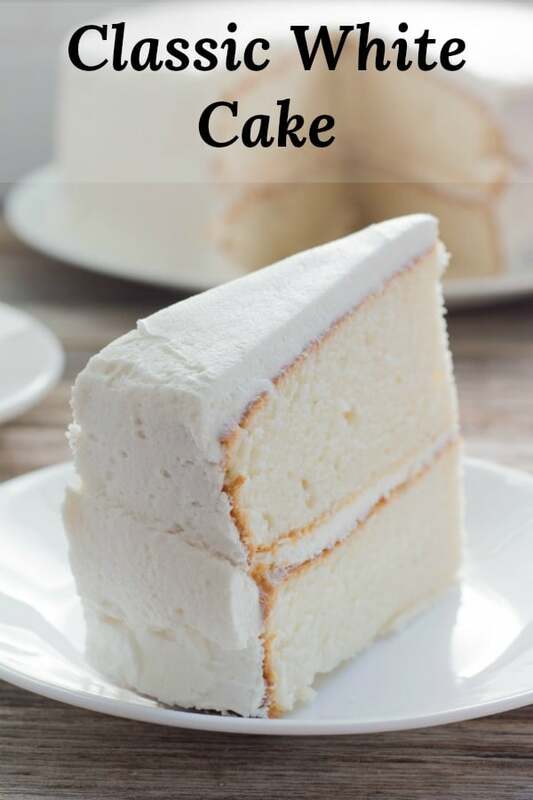 This recipe for White Wedding Cake can also be used as a white birthday cake recipe, anniversary cake recipe, or a treat your family kind of recipe. Color it red and blue for Fourth of July, pink for a princess, blue for a gender reveal cake, you can do just about anything with coloring you choose. The cake portion of this recipe is used as a base for our Cream of Coconut Cake because it holds up well and absorbs the creams. I suppose, in my mind, this is a traditional white wedding cake. Carrot cakes, filled cakes, fondant covered cakes, and the likes are all more of a modern twist. The recipe base has been around on the internet for quite some time now, WASC Cake, white almond sour cream cake. Some folks also call old-fashioned white wedding cake a white almond cake. We are currently working on a white almond cake recipe and will provide it as soon as it is available! There is some debate out there about who had the first one and which one is best. One poster swears it was hers first, and then someone else swears the other poster was first. Either way, the debate, and differences can be seen here. I use the Rebecca Sutterby white almond sour cream cake version. I can’t really call my version WASC cake though since it does not have sour cream in it. I had a container of plain Greek yogurt in the refrigerator that I had opened for chicken gyros and didn’t want to waste it, so I thought why not use it instead? The texture of this cake will not be the same as if you had baked a cake using the manufacturer’s directions. It will have a tighter crumb and perhaps seems denser. It can be sliced into thinner slices without it crumbling and falling apart before it can be moved to a plate. This one is not fluffy. After doing some serious research I have found that the most common pan sizes for layered cakes are 6″, 8″, and 10″. You’ll want 3 inch deep pans for a filling layer in the middle of each layer. 2″ deep pans will work if you do not want to slice and fill each layer. Wilton makes an entire set of pans for a very small tiered cake. These are 2″ deep pans in 4″. 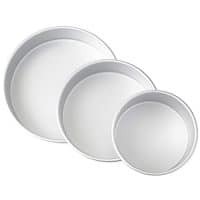 6″, and 8″ round pans and would be perfect for practicing your skills at layering and decorating cakes. If this is the route you want to try, then you should only need to make one recipe for this cake, as the package says it only needs one cake mix. 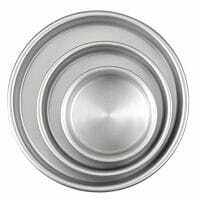 They make a different set that is 3″ deep and comes with 6″ round, 8″ round, and 10″ round pans. These are the size you would want for filled layers, as they need to be tall enough to split. You will need to triple the cake batter recipe for all of these layers. You will need at least 1 1/2 times the amount of icing listed in the recipe. Remember, you will want to crumb coat it first. 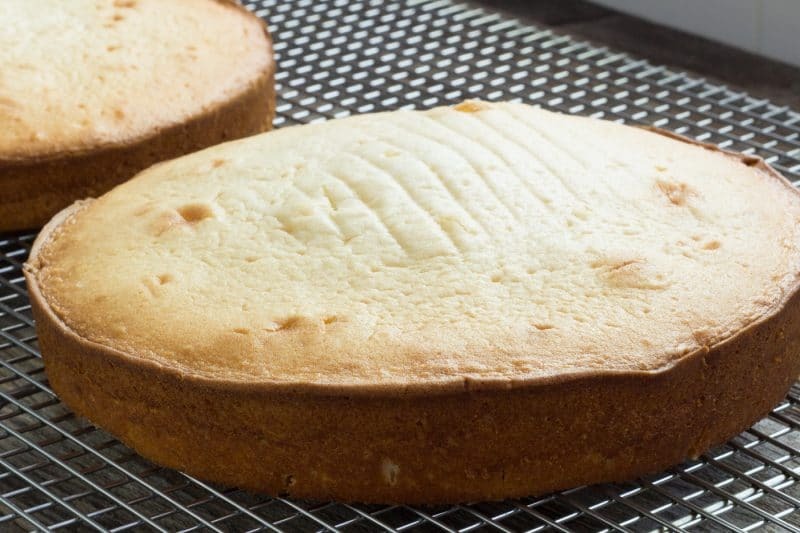 This cake is truly baked at 325 degrees F, it is not a mistake in the recipe. It cooks slowly and prevents the cake from getting a huge dome in the middle. I usually use a 9 X 13 pan because I am lazy and the looks of the finished product do not affect the taste. I try my best to avoid over baking cakes. It dries them out and makes the edges crispy (yes, this is from personal experience). I start checking this white cake after around 35 minutes if I can’t smell it yet. It will start to lightly brown on the top about 10 minutes before it is done. If it takes a little longer that’s OK. Keep reading for some recommended baking times different pan sizes. Different days require different baking times for me, even using the same pan I always use and a calibrated oven. I start checking the cakes for doneness as soon as I can smell them or 35 minutes into baking a 9 X 13, whichever comes first. Once a toothpick inserted into the very center of a cake comes back clean or with a few crumbs, I know it is time to take it out of the oven. The baking times for these pans will all be approximate, as weather, actual oven temperatures and the exact amount of batter in each pan. I would leave the baking temperature at 325 Degrees F.
6″ = 35 to 40 minutes, test for doneness and add time in 5 minutes increments until a toothpick or wooden skewer inserted into the middle comes back clean. 8″ = 55 to 60 minutes, testing for doneness as above. 10″ = 65 to 75 minutes, testing for doneness as above. Allow all cakes to cool completely before attempting to split or ice. By completely, I mean leave them alone on a wire cooling rack for at least 2 hours! There are also buttercream recipes all over the internet and I have tried to make several. In the end, I wind up going back to my own way, which was inspired by so many I would need a whole post devoted just to the white wedding cake icing recipes I have tried in my 35 years of baking. Some were good, some were not. One thing is for sure among all of them, they have some form of fat and some powdered sugar in varying ratios. 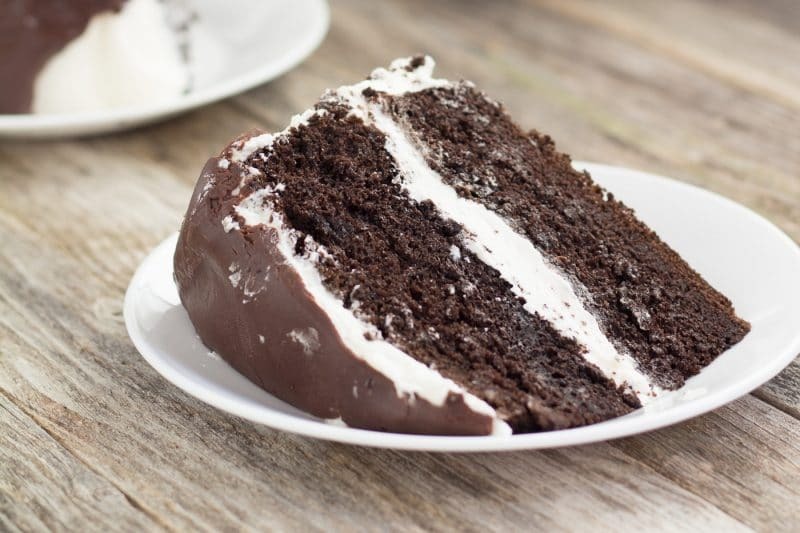 The icing recipe included in this post is no more than the way that I make it. Feel free to use any version you want. Our recipe makes a lot of icing, more than you would need for a 9 X 13 pan. But if you choose to layer this cake, you will appreciate having the extra icing. Freeze the leftovers for another use or do like I do, use the icing to coat the cut edges of the cake. 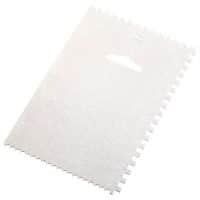 One, it will keep the cut cake sides from drying out, and two it makes more corner like pieces, you know, the ones you wanted as a kid because it had more icing. The icing is also great sandwiches between some graham crackers. As the cookies sit, they will become softer. They can be addictive. Butter flavoring is added to the icing for extra butter flavoring. This can be omitted, but it will not be the same flavor as an icing that uses all butter. I do not recommend an all butter icing because it will melt in warm environments. 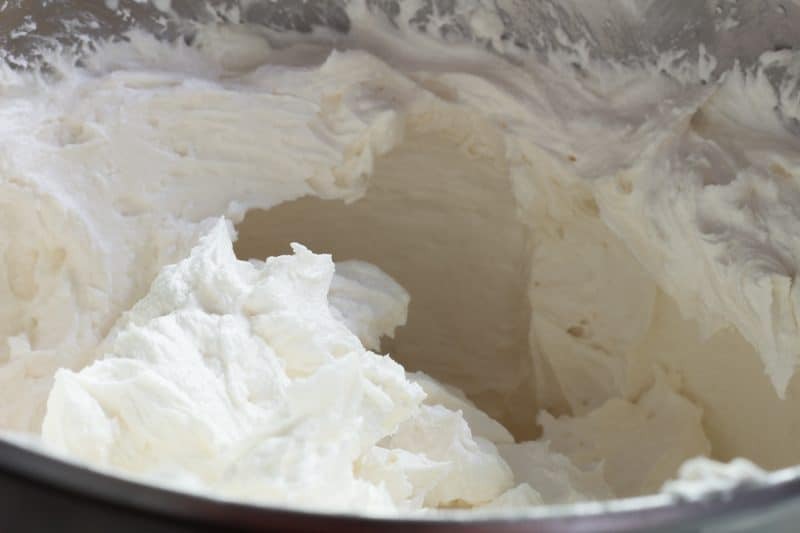 If making the buttercream icing for an outdoor event, I would recommend using all shortening and another teaspoon of butter extract. I find that using my stand mixer makes a smoother icing than a handheld mixer. It also reduces the amount of time I need to beat the icing to get it as fluffy as I want. If you are making a lot of cake layers, you may need to make several batches of icing. You can double this recipe using a 6 or 7-quart stand mixer, but any more than doubled and the icing will overflow the bowl. 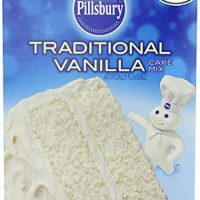 Pillsbury Traditional Vanilla Cake has become hard to locate. It used to be the cheapest boxed cake mix on the shelves. It is available in 12 packs at Amazon. Unless you intend to make a whole lot of cakes and want to have that many boxes, substitute with any white cake mix that does not contain pudding in the mix. Honestly, the cheaper the cake mix the better the cake will turn out. Lately, I have been buying Duncan Hines Classic White Cake Mix. 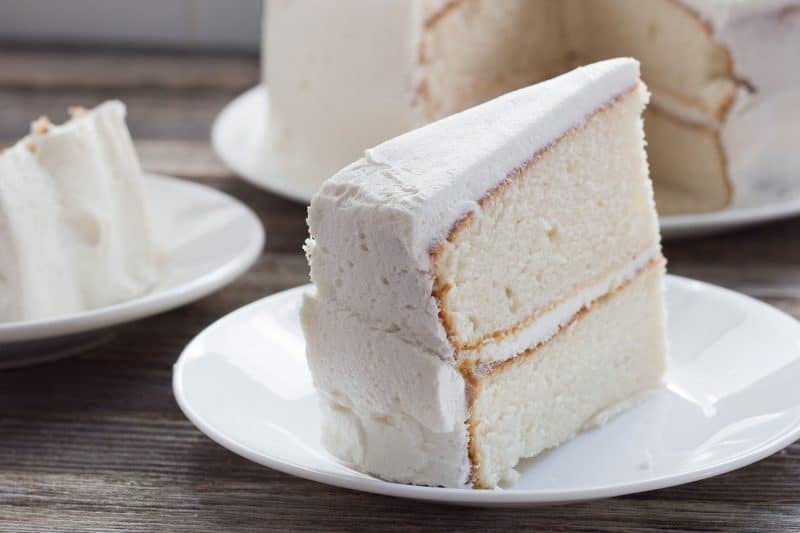 It has been readily available at the store and it has been the cheapest of the white or vanilla cake mixes that do not say moist or contain pudding. If I cannot find either of these cake mixes, I have used generic cake mixes that say “moist” on the box. Those seem to take a bit more time in the oven. but the taste will be the same. 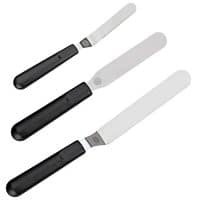 You can split the layers with a long serrated knife, like a bread knife, but I find that it is easier to split with a cake leveler. 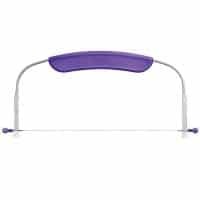 A cake leveler can cut a cake up to 10″ wide. It is also good for taking off any crowns that formed during baking. 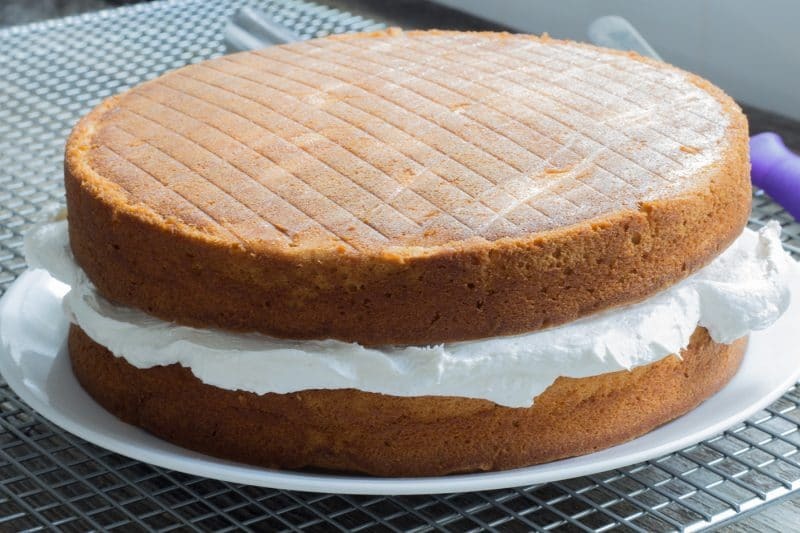 After you crumb coat the cake layers, place them into the freezer for 10 to 15 minutes to firm up the icing. Then ice the cakes. The easiest way to get smooth sides and tops are to use a tool designed for icing cakes. 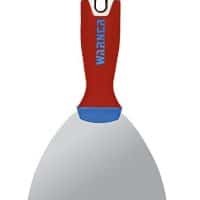 I use an offset spatula, icing smoother, and even have a wide drywall taping tool I use. The taping tool is high enough that it allows me to get the entire side of the cake all at once. 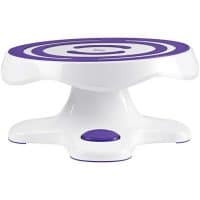 A cake turntable makes it easier to get smooth sides. This tool is not necessary but sure makes the job easier. Make a stiffer icing, by adding a few tablespoons of powdered sugar to some icing, mixing it on high, for piped borders and decorations. After many requests, we have spent some time experimenting with a chocolate version of our cake. Just like with the white wedding cake recipe, we have found that we get a sturdier cake suitable for stacking when starting with a boxed mix. There are enough differences in the ingredients it has its own recipe. That recipe is now available in our Chocolate Wedding Cake post. Spray 9 X 13 baking pan with baking spray. Set aside. Place cake mix, flour, and sugar into the bowl of stand mixer. Mix just until combined. Turn mixer to medium speed and mix for 2 minutes. Pour into prepared pan and place in preheated 325 degree F oven. Set timer for 35 minutes. If you begin to smell the cake before the timer goes off, check the cake by sticking a toothpick in the center. If it comes out clean or with just a few crumbs but no wet batter, the cake is done and it needs to be removed from the oven. Once the timer goes off, and you have not removed the cake already because it was done, check the cake for doneness by using the toothpick method. If the cake is not done after 35 minutes, continue cooking the cake and checking for doneness every 5 to 10 minutes, depending on how wet the toothpick was when testing the cake. When cake is done, remove from oven and cool completely before frosting. Place butter and shortening in the bowl of a stand mixer. Using the blade attachment, mix on medium-high for 5 minutes. Add powdered sugar 2 cups at a time and mix on slow until all sugar is incorporated. Mix milk, extracts, and salt in a small bowl. With mixer turned off, add milk mixture to icing. Turn mixer to slow and mix until incorporated. 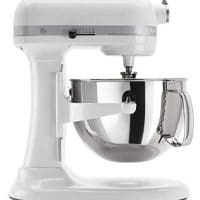 Turn mixer to high and allow to run for 5 minutes. Test icing for consistency. If you want a thinner icing, add milk 1 tablespoon at a time and mix for 1 minute. If using this pan for an important event, please do a test run with this recipe and cake pan sizes you intend to use before the big event. 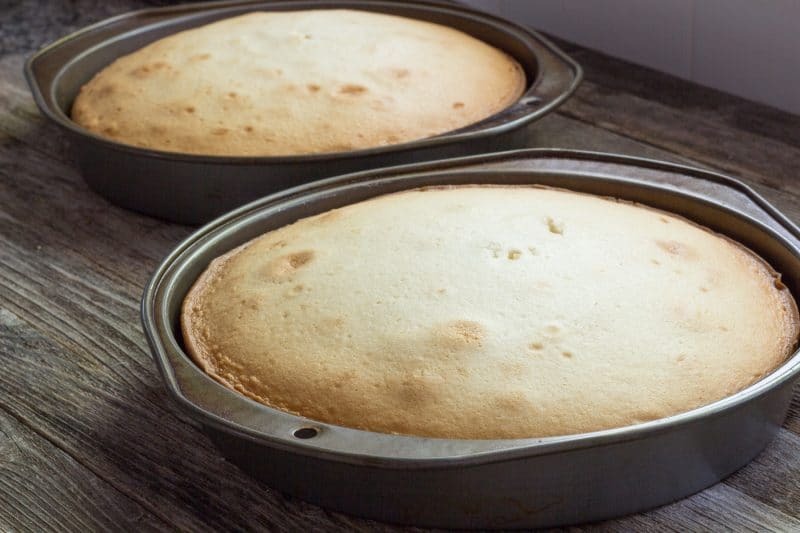 Cake recipe can be doubled for larger pans, adjust the baking time. Cupcakes can be made with this recipe, again, adjust the baking time. Can be made in smaller pans for layering, adjust the baking time. This cake needs to be supported if stacking greater than 2 layers high. Icing recipe will easily cover a 2 layer 9-inch cake, amounts can be halved if the cake is being served in a 9 X 13 pan. 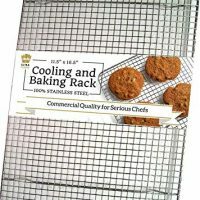 Cook time listed does not include the cooling time between baking and icing. You will get 6 1/2 cups to 7 cups of batter when using this recipe as stated. Chocolate Wedding Cake Recipe available here! ★ Did you make this recipe? Don't forget to give it a rating! This recipe is easily made in a 9 X 13 cake pan for an everyday dessert! I make it this way more often than as a layer cake. This White Wedding Cake Recipe can also be used as White Wedding Cake Cupcakes, or Birthday Cupcakes, or just everyday white cupcakes. It will make about 36 cupcakes. Also baked at 325 Degrees F. But only 18 to 20 minutes for those. The oil in the cake recipe can safely be substituted with unsweetened applesauce but I wouldn’t try and use applesauce in place of shortening in the icing. Hope this helps! Has anyone tried to substitute unsweetened apple sauce for the shortening? Let me know. I’m going to make this cake for Easter. Thank you! I think butter as a substitute would be fine! You might find that this cake acts more like a pound cake than a regular box cake made in a bundt pan so I would probably treat the pan appropriately. 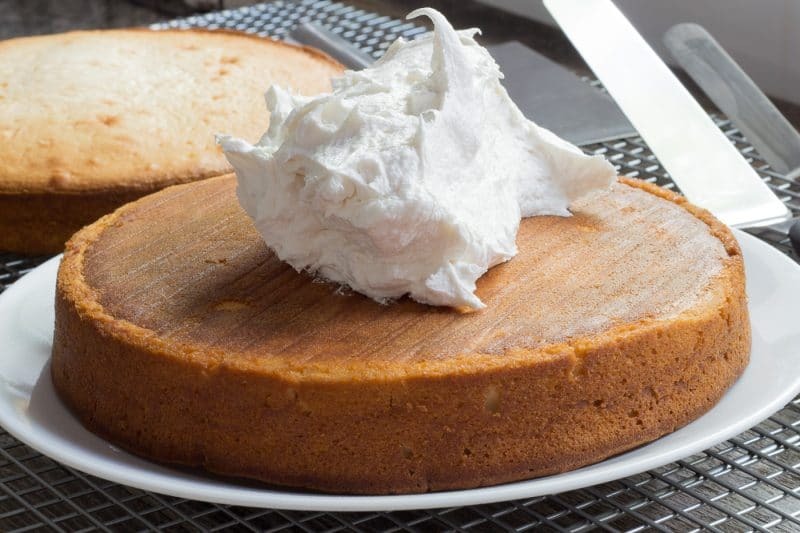 Our pound cake post has some tips for this https://peartreekitchen.com/rich-butter-pound-cake/ as well as links to King Arthur Flour’s tips! Sounds wonderful. I am baking a cake and travelling 3 hours so opting for a bundt cake. Also, can mekted butter be substituted for the oil? I don’t do a whole lot of gluten-free baking but if I were going to try to make this gluten free I would definitely start with a gluten-free cake mix and use all-purpose gluten-free flour. I would also add a teaspoon of xanthan gum. I would also make this a couple of times before the big day just to make sure it works! Also, check whatever brand of powdered sugar you use is gluten-free. Many are but some aren’t. If you can’t find a gluten-free lemon cake you can try using a white cake mix and all lemon extract, skipping the vanilla and almond. Even if you do find a lemon cake I would skip the almond. Hey! Im making my friend a wedding cake, and she wants it gluten free and lemon cake. I figured this would be a good base to go off of, as its very dense and moist so the gluten free flour wouldn’t make the cake too dry. A gluten free lemon cake mix was what I was thinking of replacing the box mix with. Do you have any suggestions on how I could make this gluten free lemon cake? Thank you! You could try it! I’m not so sure how it would work with a cake mix as a base though. I use this recipe because it isn’t as fluffy and is well suited for stacking and slicing into thinner slices. Let me know if you do try it and let me know your thoughts! I love recipe improvement tips! 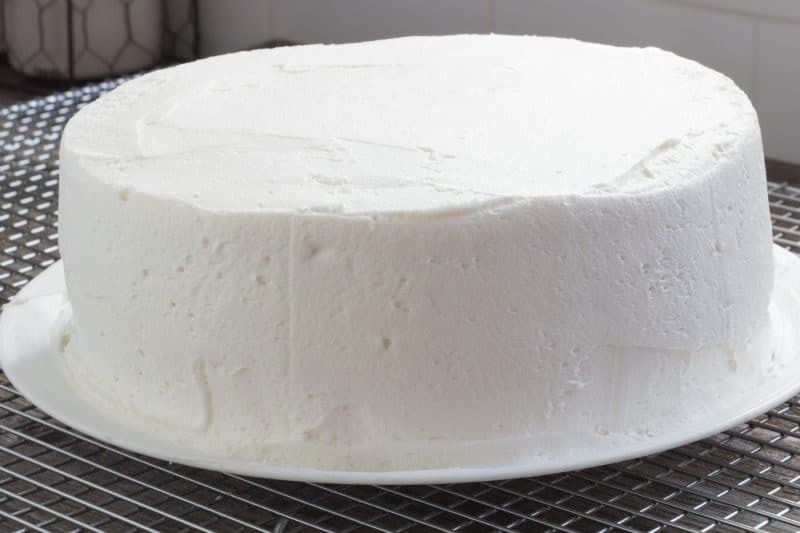 The only time that I ever attempted a bakery style cake, I remember that the recipe called for whipping the egg whites as the very last thing, and gently folding that into the cake batter. 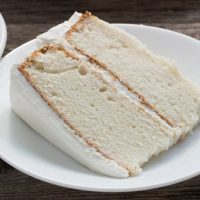 This made a very level cake without a “crown.” Do you think that would work with this cake, and possibly give it a lighter, fluffy or texture? Yes, you can add food coloring to the icing for piping! I would use gel coloring for the best colors. You can also make the icing thicker for piping by not using as much milk in the beginning or by adding a bit more powdered sugar. Hey! Can you add food coloring to the icing for piping? 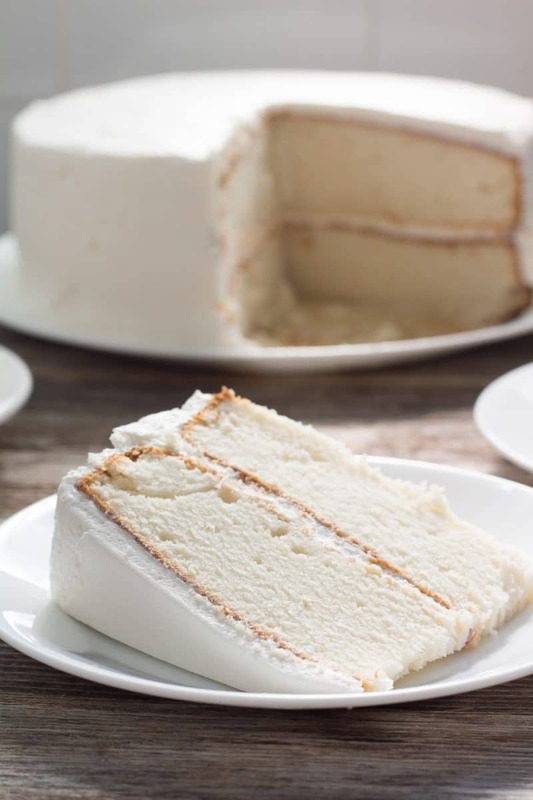 Thanks so much for letting us know how your experience with our white cake recipe was! I am so glad you have had success with this cake more than once! Hi! Thank you so much for this amazing recipe. I made it into a 4 layered unicorn cake for my daughter’s 8 year birthday party and it was a huge hit! It’s my second time making this recipe and everyone loves this cake. Plus the frosting is delicious! Super easy recipe and my family and friends think I’m a professional baker. LOL! Thanks for stopping by and letting us know how this cake turned out for you! Congratulations to your daughter!! Thank you so much. I made this cake for my daughter’s wedding. It was moist, delicious, and solid(in a good way). I received many compliments. I will be saving this recipe for future events. Thanks for stopping by and letting me know how your cake turned out! I do not have any ideas how to turn this one into a fluffy cake. Maybe just adding some vanilla and almond extract to a cake mix and following the directions on the box would work. We are cake snobs and your recipe was a hit all around! I followed your instructions to the letter and my results were identical to yours. This is definitely an old-fashioned wedding cake and is absolutely delicious! I sense that some of your readers might be used to a lighter, fluffier version of wedding cake? Do you have any advice about how to make a lighter (bakery style) version of this? Finally, your instructions and hints were outstanding. So thorough and easy to understand! Thanks so much! Thanks for stopping by and leaving a great tip! That might explain why we seem to like our cake on the second day! Thank you so much for this recipe! I have baked both a cake and cupcakes, each time turning out perfect! My family , especially my daughter loves it and I’m making cupcakes for my granddaughters birthday. In one of the comments, she said the icing was too sweet, if made ahead of time, the icing gets less sweet as it sits! Don’t know why but it’s perfect after a couple of days. My cakes always came out too dense with “pudding in the mix”. It felt like it had a weird texture. Gummy and almost wet, but I am willing to give it another try next time I make one. Maybe the formulas have changed since my bad experience with it. Hi I was wondering why you dont use cake mix with pudding in it? I have used pudding and it has come out wicked good. I was just wondering. Thank you for stopping by and leaving us a 5-star recipe rating! We are so happy to hear that you liked the wedding cake recipe! I’m not sure how to add photos to comments either. BEST EVER! WILL BE DOING CUPCAKES HERE IN 2 WEEKS FOR A REHEARSAL DINNER. EXCELLENT! HAVE A GREAT PIC IF MY FIRST CAKE BUT NOT SURE HOW TO ATTACH IT. I have used both sized boxes without a problem. Once you add the additional cup of flour and sugar, the 2 to 3-ounce difference really isn’t a huge difference anymore. The only time I have ever had a problem with this recipe is when I try and bake it with a higher temperature or get in a hurry and take it out before it is done. I use the new size box these days and I buy my mix in the grocery store. My favorite is the Traditional White by Pillsbury and it comes in a 15.25-ounce box. It used to be carried locally but has become unavailable in the Tulsa area. I use whichever white cake mix is the cheapest, unless it says “pudding” in the mix. For your strawberry cake recipe that is no longer working, you can try adding a half of a cup of flour, plus a couple of tablespoons of sugar to your cake mix before adding any other ingredients. Alternatively, you could try reducing the liquid in your recipe. A third possibility is to buy 2 boxes of the base cake mix and add about 1/4 of the second box to your base before beginning. I have been using smaller boxes for over 8 years now and I have not altered the amounts of anything. The only change I have made was to replace sour cream with Greek yogurt. Perhaps the thicker nature of Greek yogurt might explain my continued success with this recipe. Michaels carries an 18.25-ounce cake mix now, its called Sweetshop™ Premium Cake Mix. Hi, I have made a number of wedding cakes and would love to try this one but I have been avoiding cake mixes because of the changes they have made in the size of the mix. I had a strawberry cake recipe that I made every year for my daughter with a mix that everyone loved then suddenly it didn’t work anymore. I realized that the mixes sold now were 15 or 16 oz instead of 18 oz and it DOES NOT work – cake is soggy and heavy as lead!!! Unless I see the ounces of the mix in the recipe I won’t go near it! So what size mix did you use in your recipe- the new version of 15-16 oz or is the ones you order on Amazon the original 18 oz box? I’d love to know because I’ve heard a lot about this recipe. This recipe will make 6 1/2 to 7 cups of batter. Do you know about how many cups of batter this recipe makes? Thanks for stopping by and leaving a comment and 5-star review! We are very happy to hear that you had success with the recipe for such an important event! OMG! AMAZING! I used cake flour and sour cream and it came our perfect. I made my daughters 4 tier wedding cake. PERFECT! What does shortening means please ? Thanks for stopping by and dropping us a comment and a 5-star rating! So glad to hear you had success with the recipe! Everyone loved it. Had a few people ask for the recipe. I will make it again. It can! There are some alternative baking times listed in the post itself for different sized pans. If the tiers are going to be large, I would add some supports. Can this cake be used for tiers. In making a 2 tier cake. Thank you. Thanks for visiting for visiting our site and leaving a 5-star rating! We are so glad to hear that you liked the cake! Hope your friend has a great birthday! Me and my friend made this to taste before trying to make one for a party. It was THE best cake. We will be making this for our friend’s birthday cake! Just plain all-purpose flour. Unbleached actually, but regular all-purpose works just as well. Congratulations on 50 years!! I am so happy hear that you enjoyed the cake! If you choose to use a sugar replacement, just make sure you use one that is formulated for baking, following the manufacturer’s recommendations for equivalents, and it should be fine. This does make a lot of frosting! I freeze extra I have, allow it to come to room temperature, give it a good mix and it’s good to go. Love this cake. Made it for our 50th anniversary and again for a neighborhood gathering. One comment was too rich but it was almost gone. I. Would like to replace some of the sugar for an artificial sugar if it would raise ok. I can reduce some of the sugar in iceing as it is good but you do not need all of it . I saved some for cupcakes. Love almond flavering too! I love hearing that someone is “new to this” but is not giving up and keeps practicing! This is how it all starts – the love of cooking. Please reach out if you have more questions. You can also email me directly! Yes, I meant the inside of the cake. I mixed it for the 2 minutes and I was thinking maybe undercooked? I didn’t realize it until after it cooled though. I used two 9 inch pans for 35 min. I will have to practice some more lol. I’m new to this! Thank you so much for your quick feed back!! I’m sorry to hear you are having difficulty with this recipe. It can be a bit sticky on the top, especially on humid days. If you mean sticky and thick on the inside it may have been under-cooked or under-beaten. Sometimes, depending on which cake pan I used, it takes longer to cook, up to 15 minutes longer. I have several pan that are supposed to be 9 X 13 but actually aren’t, a few of mine make taller cakes and those pans take much longer. Make sure you are mixing it at least 2 minutes to get some air into it. This cake should have a finer crumb with less air bubbles than a regular cake mix. Think more like pound cake texture. Additionally, another commenter said she reduced her oven temperature to change the texture of her cake. 325 Degrees F is where I bake mine at. My oven runs true to temperature. I cooked this cake last night and loved the flavor but my cake was sticky and thick! What can I do to fix that ? I use salted. If you use unsalted butter, give it a taste and if necessary add another pinch of salt. For the icing do you use salted butter or unsalted? Absolutely! But you may need to adjust your baking time for a larger pan. is it ok to double the recipe? Looking to make a large sheet cake. Interesting concept! I have never tried cookies since this batter is thin. If it’s just the flavor you are looking for rather than a texture thing you could try just adding almond and butter extracts to a sugar cookie dough. Is there a way to make this cake into cookies. I have made these as cupcakes. Baking time will depend on the amount of batter you use for your cupcakes. I sometimes use taller baking cups for larger cupcakes and those take a bit longer than standard sized liners. Standard size should take 15 to 20 minutes. I always stick a toothpick in the center of one of the cupcakes in the middle of the pan. Even when using taller liners I start checking at the 15 minute mark if the center doesn’t look wet, these have taken as long as 30 minutes for me. Just a side note, in my experience, the icing has a tendency to slide off the cupcakes after a couple of days, so I would not prepare these too far in advance. Have you tried this recipe as cupcakes instead of cake and if so what was the baking time adjustment? You might need to make more batter but it should work. The baking times will be different on the pan sizes and thickness of the cakes will make a difference. I would suggest a practice run and checking for doneness at 25 minutes. 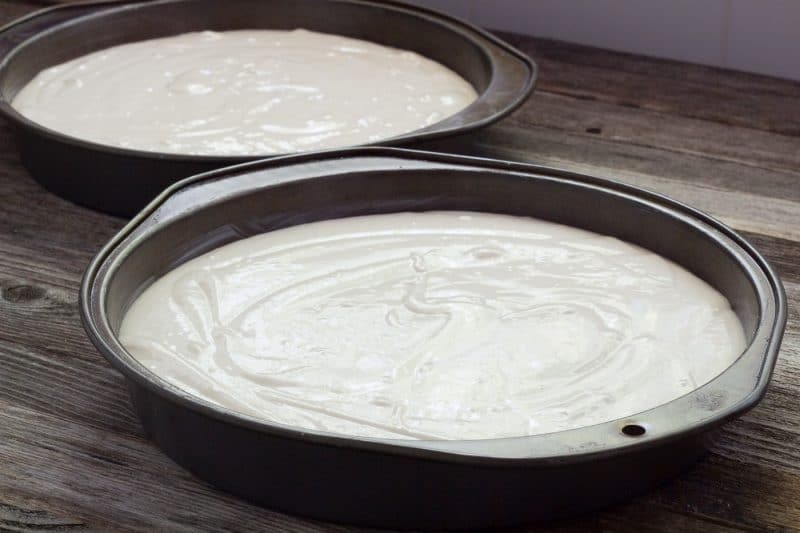 I would also grease and flour the spring form pans rather than just use a cooking spray and allow the cakes to cool completely before removing them from the pans. Im looking to use 2 spring form pans for a wedding cake. 9 and 8 inch. Would that work? And if so would all the batter be placed in the 9 and half divided in the 8? Help! SO happy you found a solution that works for you! Oven temperatures can vary by quite a bit. I have never tried to make a yellow cake with this recipe. You could try a cheaper cake mix, I find that the high end cake mixes do not work as well with this recipe. Thank. Actually lowering the temp to 300 fixed the problem. This is my go to white caje recipe now. Im still trying to find a good yellow cake recipe tho. 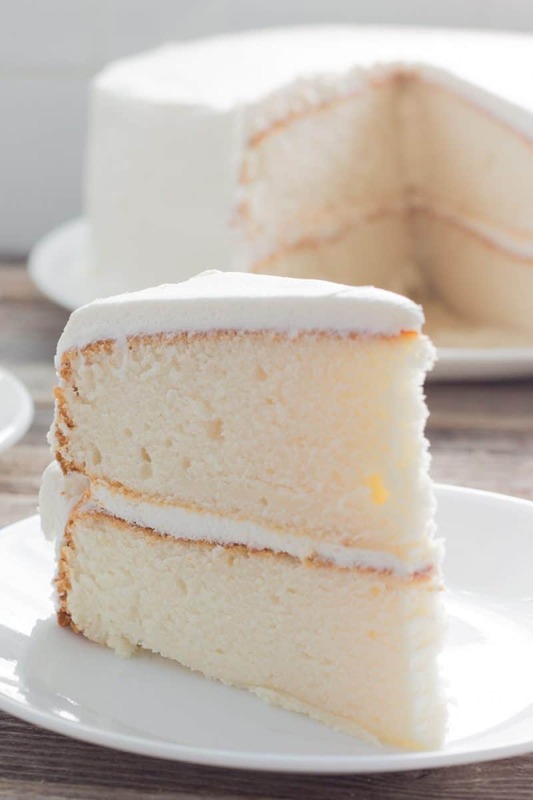 I actually used this recipe and just used yellow cake mix instead of white and three whole eggs instead of 4 egg whites and it did pretty good but it tastes more like a box cake mix than i would like. Any suggestions? It was supposed to say flour. Spelling error has been fixed! Thanks for catching my grammatical error! What do you mean when u say add cake mix,four mean . I have seen some recipes that substitute chocolate fudge cake mix for the white. In addition, adding a tablespoon of instant coffee to the batter will help boost the chocolate flavor. Vanilla is the only flavoring I would use if i were going chocolate. Enjoy! Hi! I’m new to baking….Can this be turned into chocolate cake by adding cocoa powder or would you suggest actual chocolate cake recipe? So glad you liked the taste. This does make a lot of frosting! Sometimes I freeze the leftovers and thaw them in the refrigerator for another use, other times I used the left over frosting to frost the cut sides of my cake to keep it from getting hard, I figure no one ever complains about extra icing on a cake! Update. ..I tasted it the cake was very good, the frosting only need half the amount maybe a quarter of amount. The frosting was way to sweet. I haven’t tasted it yet however, mine in a 9×11 pan didn’t rise well. It left a bit of a indentation in the middle. On the bright side I had enough frosting to fill it up and still had at least a third left over. Tons of frosting. Hopefully it will taste great as I made it for my husband’s birthday. Sorry that this cake didn’t turn out for you. When I make it, it has small crumbs but nothing I would consider crumbly. 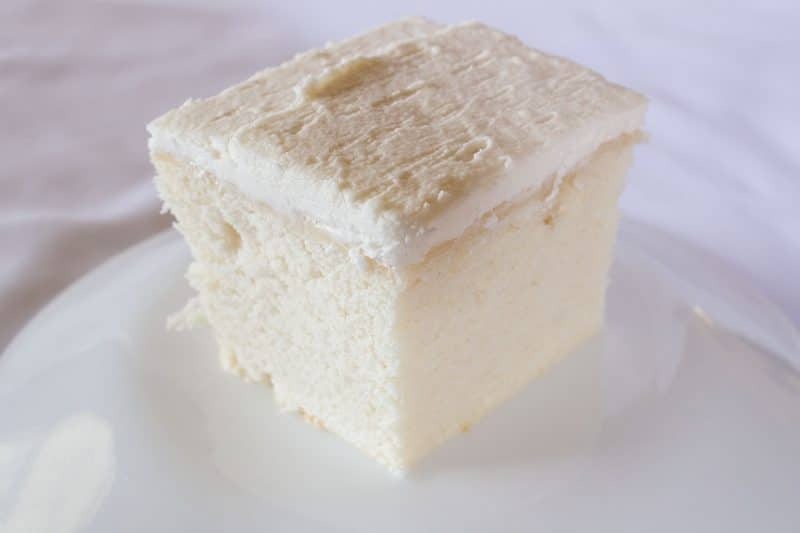 The texture should resemble an old fashioned wedding cake which had texture similar to pound cake with a little bit of spring like an angel food cake. Short of buying a commercial bakery mix from a restaurant supplier, this recipe is the closest I have ever gotten to the cakes I was trying to recreate. Hi Kim! I prefer the yogurt! This turned out more like pound cake and the outside of the caje was really thick and crumbly. I wanted a flakey moist cake like a bakery. I wouldn’t call it super strong, but you can taste it in there. It can be omitted or reduced. If have never had anyone complain that the almond flavor is overwhelming or anything. If you have tried the new Blue Bell Bride’s Cake Ice Cream, the flavors are very similar! Is the almond flavor super strong? You can just omit butter flavoring. Hello! I don’t care for butter flavored extract. Is there a substitution you would recommend? Or, just omit? Thank you. In opinion of you, and others who have had tried this is the sour creme, or yogurt tastier? Yes! I use round pans for layering. I start checking my round pans a few minutes earlier than a 9 X 13. All-purpose flour is one I use for this recipe. Unbleached to be more precise, but bleached works just fine. Anytime I see a recipe that calls for just plain flour, I use unbleached all-purpose flour. Is the flour Cake Flour, Self Rising flour, or All Purpose flour? I’m always confused when a recipe just calls for flour. Using yogurt or sour cream in this recipe is what gives the cake extra moisture. You can try the recipe without the addition of either, it might come out a bit dry and the bake time may need to be reduced. If you are not opposed to using dairy substitutes, like soy or almond products, you could use any of those yogurt or sour cream options. I am amazed at the number of options most stores carry these days. Sounds delish! Can I make it without the yogurt? I’m dairy free. Since a box cake mix is a complete mix, I wouldn’t use just flour for the cake mix. If you wanted to try it without a mix you might try using 2 1/2 cups flour, 2 cups white sugar, 1/2 cup powdered milk, and 2 teaspoons baking powder. I have never tried this option, so I can’t comment on an outcome. Let me know how it turns out if you decide to try a substitute! Hi! Is there a way to eleiminate the box cake and use flour?